Rep.-elect Rashida Tlaib (D-Mich.) plans to lead a congressional delegation to the occupied West Bank next year, breaking with the traditional visit to Israel for newly elected members of Congress sponsored by the American Israel Public Affairs Committee (AIPAC), The Intercept reports. The big picture: Tlaib, one of the first Muslim women elected to Congress, told The Intercept that she wants the delegation "to see that segregation and how that has really harmed us being able to achieve real peace in that region." She added, "I don’t think AIPAC provides a real, fair lens into this issue. It’s one-sided. … [They] have these lavish trips to Israel, but they don’t show the side that I know is real, which is what’s happening to my grandmother and what’s happening to my family there." Details: Last year, the Democratic members who traveled to Israel for the seven-day AIPAC trip had only one 75-minute meeting with a Palestinian official, The Intercept reports, instead meeting with Israeli officials and business leaders for most of the itinerary. Republican members also had one briefing with Palestinian officials during their trip. The big picture: Rebecca Vilkomerson, the executive director of Jewish Voice for Peace, which supports an end to the Israeli occupation, told The Intercept: "Palestinian rights are being integrated into the broader progressive agenda. It's becoming also standard that if you support single-payer health care and climate justice, you'll support Palestinian rights." That's reflected in a September Economist/YouGov poll, which shows that only a quarter of Democrats view Israel as an ally — compared to 59% of Republicans. 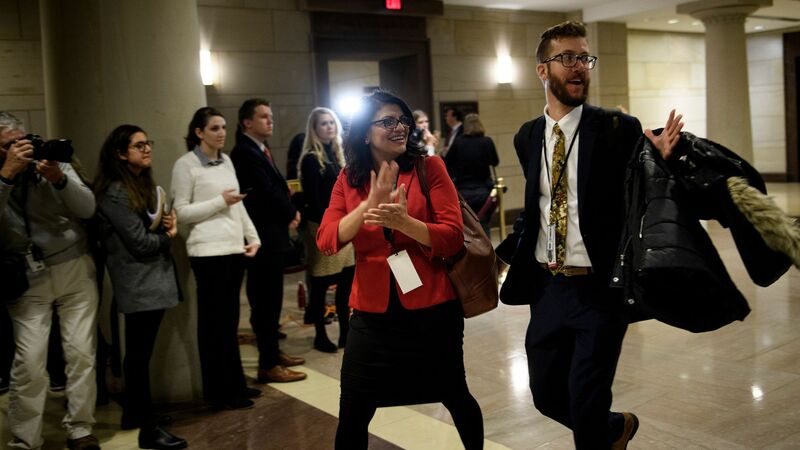 Tlaib also told The Intercept that she is a supporter of the Boycott, Divestment, and Sanctions (BDS) movement, which uses economic boycotts of Israeli goods to show support for Palestinian rights. She said that BDS is a way to highlight "issues like the racism and the international human rights violations by Israel right now."